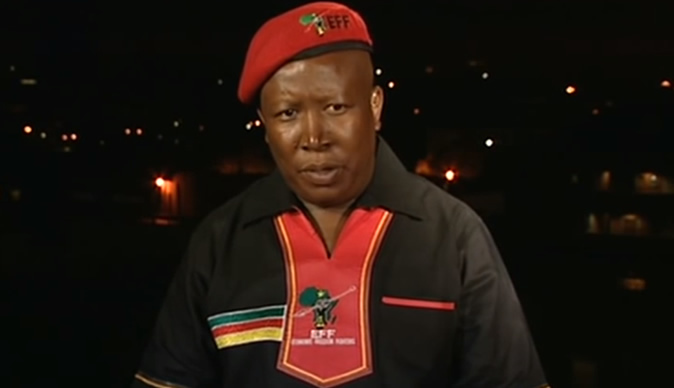 South Africa's Economic Freedom Fighters Commander In Chief Julius Malema fears has told members of the press that he fears for the safety of his wife Mantwa Matlala and his children after his address was posted on Twitter by a freelance journalist Jacques Pauw . Pauw tweeted the address of the house of Malema's wife claiming it is being rented from Cigarette manufacturer Adriano Mazzotti. Addressing a press briefing at Parliament on Tuesday after the National Assembly adopted the Joint Constitutional Review Committee's report recommending that the Constitution be amended to allow expropriation without compensation, Malema said "many strange cars" has been spotted around the house. "The EFF brand has to go through the test, if it is weak and based on weak principles then it will be destroyed by rumour mongering. My wife is educated and comes from a stable family, she is an independent woman and for her to survive, she does not rely on me or any other man. "Anyone that wants to attack her using me, is undermining the very women they claim to stand for. What worries me is that I have 3 little children in that house, that stay with her and anything could happen, it could get dangerous for them." Malema asked if he is not threatening a journalist when he said, "I shoot to kill." In response, the firebrand leader said, "Wait until I involve Pauw's wife and children, then you will say I am threatening journalist. They have tweeted my wife's car and now she can't even take my child to pre-school. But if I do that to him, I will be called names." Mazzotti has often been described by the media as a self-confessed cigarette smuggler and has been accused of evading taxes.